Art has always had a difficult time balancing the competing pressures of money and integrity. Artists have a vision they want to execute but they also have to eat. The car industry isn't much different. Fanciful and daring concepts from a car company's design division are often opposed or heavily modified by the more practical divisions like manufacturing or engineering. That's not always a bad thing as the classic The Simpsons episode "Oh Brother, Where Art Thou" illustrated when Homer Simpson was given a free hand to design the car he wanted and ended up bankrupting his half-brother Herb, owner of Powell Motors. While Bob Lutz is unlikely to make the same mistake as Herb Powell did, he too believes that the automotive industry has too long been under the domineering sway of analysts and accountants. 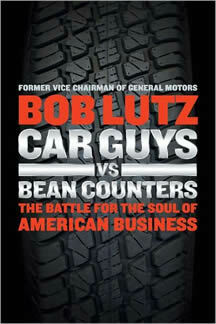 Lutz, a nearly five decade veteran of the auto industry with companies like BMW, Chrysler and General Motors, argues in Car Guys vs. Bean Counters: The Battle for the Soul of American Business that the industry needs more people who love cars and fewer who only think of the process of selling cars purely in terms of numbers. One gives you something daring like the Pontiac Solstice, the other introduces the Pontiac Aztec. After a lengthy tour through the auto industry, Lutz became vice chairman of GM in 2001 and charged to turn the company around. As he relates, the company was in a bad way. For decades the com4pany's market share had been eroded by foreign automakers, internal power struggles hamstrung everything from design to manufacturing, and it seemed more focused on squeezing every last penny of revenue then actually building a quality product. The company seemed incapable of producing a vehicle that could capture the attention of consumers, thanks to a process that rewarded getting a product to market on time regardless of whether it tested well. Senior executives could earn huge bonuses sending a car to a showroom that no one actually liked or bought, as long as it met cost targets. For the next nine years Lutz waged a one man war against the number crunchers, the ones who attempted to change innovative designs into mediocre finished results to save a few dollars. Creativity and design were lauded by Lutz as the means to create products someone wanted to buy. The enemy was the spreadsheet and the legions of highly educated MBAs who knew how to cut spending but had no sense as to what a great car really was. Whether he was ultimately successful is up to the reader to decide though it must be noted that the company's share of the U.S. market continued to erode this year to competitors Ford and Toyota. Politically, Lutz is difficult to nail down. At one point he rails against government policy which ignored an artificially low Japanese yen throughout the 1970s and 80s and severely hampered the competiveness of the Big Three. He also argues that Corporate Average Fuel Economy (CAFE) standards were unnecessary government regulation. Later, however, Lutz announces he dreams of a day when Americans pay 6 to 7 dollars a gallon for gas and the electric car dumps the internal combustion engine into the ash heap of history. It doesn't weaken the book but the reader might wonder what grand philosophical idea – outside of anything automotive – actually guides his thinking. When Car Guys vs. Bean Counters was first announced much was made of its attacks on Rush Limbaugh and Glenn Beck for their criticism of the bailout package GM received from the U.S. federal government. Although much was made Lutz's comments, the reality is that Limbaugh's name is mentioned a mere two times (and Beck not much more) and his defense against the criticism occupies a few scant pages in the entire book. The overwhelming majority of the book is devoted to Lutz's struggles to reshape GM into a more risk taking (within rational limits, of course) organization. Car Guys vs. Bean Counters is a manifesto and like all such efforts it is hobbled by a single perspective. Doubtless number crunchers shouldn't be given too much power in an enterprise that relies on creativity and design. That said, too much experimenting and forward thinking gives us the aforementioned Aztec. Quibbles aside, Lutz's effort is an entertaining and insightful one, full of the kind of insider stories that people love to read and learn from. Lutz should consider another volume with stories culled from his legendary career given how personable a person he seems to be. Steven Martinovich is the founder and editor in chief of Enter Stage Right. He drives a Jeep.